George Clooney has refused to accept an apology from the Daily Mail's website over a story claiming his fiancee's mother objected to their marriage. "The Mail knew the story... was false and printed it anyway," he wrote in a statement published by USA Today. The paper, he continued, was "the worst kind of tabloid. One that makes up its facts to the detriment of its readers." The Mail Online apologised "for any distress caused" by its story, while denying it had been fabricated. 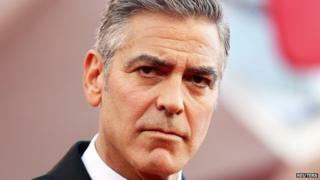 Clooney thanked the Daily Mail for its apology before adding: "Not that I would ever accept it." "What separates this from all of the ridiculous things the Mail makes up is that now, by their own admission, it can be proved to be a lie." Clooney first voiced his dissatisfaction with the Mail on Wednesday, accusing it of "irresponsibility" and "inciting violence" by claiming Baria Alamuddin objected to him marrying her daughter Amal on religious grounds. The Mail's report - published online on Monday and then in print on Tuesday in an amended form - said "close family friends" had told them that Baria Alamuddin had been "telling half of Beirut" her daughter "could do better". In its apology, the Mail Online said the story had been "supplied in good faith by a reputable and trusted freelance journalist" who had "based her story on conversations with a long-standing contact". Clooney took issue with this in his latest statement. "The problem is that none of that is true," he wrote. "So either they were lying originally or they're lying now. "There is one constant when a person or company is caught doing something wrong," his statement began: "The cover-up is always worse." The ongoing dispute between Clooney and the Mail coincides with reports of another Hollywood A-lister taking action against the paper's online division. According to The Times, Angelina Jolie has begun legal action against the newspaper for publishing a video obtained from the US National Enquirer tabloid. The accompanying story alleges the video, apparently filmed in the 1990s, alleges to show the Oscar-winning actress "in [the] grip of heroin addiction". "The actress is believed to regard the publication of the video as a gross violation of her privacy," said the Times.